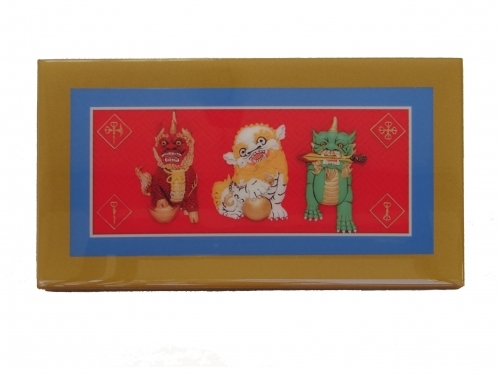 This rectangle shaped 3 Celestial Guardian Plaque, which has 3 celestial guardian with mantras surrounding the image of the 3 celestial guardian, is specially designed for diminishing down the effect of 3 killings. The 3 Celestial Guardians are divine creatures which are Fu Dog (foo dog), Chi Lin and Pi Yao. They are the best feng shui cure to the deadly flying star 3 killings. They are the celestial animals sent to Earth by the God of Heaven to safeguard the trinity of Heaven Earth and Human. Mantras are the powerful scripts to protect home or business premises. Fu Dog which has strong muscular body and fear-inspiring face is the door guardian of the heaven gate. Fu Dog is also called foo dog, lion dog, temple lion or Chinese civilian door gods. In feng shui, Fu dog displayed near to the door or the wall way can prevent evil spirits and harmful people into the home or business premises. Fu dog safeguards homes and brings nourishes energy into homes. Chi lin which have the dragon head and scales of carp over the body of horse body are heaven creature to attract the powerful cosmic breath of the dragon. Chi Lin is also called Dragon horse, Kei Loons or Chinese Unicorn. They can bring success, prosperity, wealth, enchantment and longevity. They are also the creature to bring good omens and outstanding offspring as well as keep off bad chi. Pi Yao which has one horn on its head and two wings on its body is the mystical creature to bring good fortune and extra income. Pi Yao is also called Pi Sou or PiXiu. Pi Yao is the best feng shui product to appease Tai Sui - Grand Duke Jupiter. The dimension of the 3 Celestial Guardian Plaque is approx. 11 1/4" x 6 1/4" x 3/4". It is made of wood and it can be either displayed or hanged. The position for the 3 Celestial Guardian Plaque is where the deadly flying star 3 killings locate. In 2016, You can display 3 Celestial Guardian Plaque in the South position.